The New Era of Our Lady of Fatima and St. John Paul II or of the Book of Eli? The Book of Eli is a 2010 movie starring Denzel Washington. It is about a man named Eli who carries a book alone across America towards the West. A “voice” told him to preserve the book. He is on a trek of 30 years since an apocalyptic war. The book is the King James version of the Bible, a Bible without many of the parts of the true Bible. On his trek, Eli encounters many survivors in need but he passes them by as he recites his mantra to himself, "Keep walking it's not your concern." Apparently, love of neighbor was not his concern and he did not meet any Christian communities. He walks alone across the carnage of an American landscape that is still devastated 30 years after the war. The land is populated by evil people, including cannibals, and they don’t love their neighbors. Eli surrenders the Bible to the head of a bad guy gang after he is defeated in the siege of a house. However, he had memorized his entire book and took his memory with him to San Francisco. They had printing presses there, he dictated his book and the printing presses rolled. Apparently, the world would go on with only the King James Bible, no Church, no Teaching Authority, every man for himself and every man to interpret the Bible as he wills. Some people think that it might be like this after coming prophesied chastisements. I don’t. Their aftermath will not be anything like the Book of Eli. Jesus left us a Church, not a book, the Church gave us the Bible and it wasn’t the King James version. The Church is the Teaching Authority to correctly interpret the Bible and its truth. There can be no private interpretation. As Jesus promised us, the Church will survive any chastisement, he will always be with us and he will not leave us orphans, but he will provide for us and protect us. Hopefully, through the chastisements we will trust God, give hope to others and help them by doing the next right thing. These warnings of chastisements are conditional upon our response to the angel’s cry for penance. If we respond, they may not come. If we do not, they probably will. However, the aftermath of any chastisements will not be like it was in the Book of Eli. 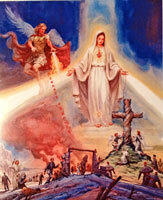 Instead, it will be the New Era that Our Lady of Fatima prophesied. St. John Paul II, who believed that he consecrated Russia to the Immaculate Heart of Mary, as she requested, announced this New Era. It won’t be every man for himself as in the Book of Eli. Please click here to learn what we hope the New Era of Peace will be like. For more information on prophesied chastisements by the Blessed Virgin Mary and how to prepare for them, click here. “When the storm has swept by, the wicked are gone, but the righteous stand firm forever.” (Proverbs 10:25).